Info "Ahh, put a plug in it." Spout Off is one of Dr. Crygor's microgames in WarioWare: Twisted! The game's purpose is to put the rock in the fountain. To do so, the player has to roll it by tilting the Game Boy Advance carefully. 1st level difficulty: There are no obstacles in the rock's way. 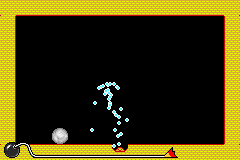 2nd level difficulty: There are no obstacles in the rock's way, however, the fountain is on the wall. 3rd level difficulty: There is an obstacle in the rock's way and the fountain is on the wall. The game's description, "put a plug in it" is pun on the expression "put a sock in it."